All the questions covered in sample practice exam are basic IASSC Certified Lean Six Sigma Black Belt Certification exam questions. To test your knowledge and understanding with the real-time case study based questions, we strongly recommend you to practice with our Premium IASSC Lean Six Sigma Black Belt (ICBB) practice exam. 555+ Practical and Real-time Case Study Based Practice Exam Questions similar to actual IASSC ICBB certification exam and their correct answers for assessment. 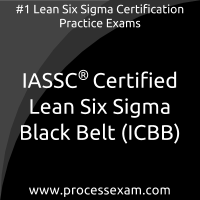 2 Months Unlimited Access to online IASSC Certified Lean Six Sigma Black Belt (ICBB) certification practice exam. Price is just $45.80 USD which is lowest compared to any other offline or online materials. We have a dedicated team of IASSC certified experts who are having more than 12 years of experience in the field of Business Process Improvement. Our structured and autonomous review system collects feedback from recently certified candidates, based on those inputs our domain experts frequently update IASSC Lean Six Sigma Black Belt test questions for practice. Our online practice exam is a simulation of the actual IASSC Certified Lean Six Sigma Black Belt exam that makes you familiar with actual exam environment and exam pattern. We offer unlimited practice attempts with our online practice test. Every attempt randomly populates questions from our premium IASSC ICBB question bank that contains 460+ most probable case study based questions prepared by our domain experts. Practice questions will be served in random order with shuffled multiple choice answers to make your IASSC Certified Lean Six Sigma Black Belt exam experience more challenging. You can review the results of past practice attempts from result history and assess your performance. Such facilities are the significant advancement over questions in ICBB PDF and far better than fraud dumps sites. According to our survey with IASSC ICBB Certified candidates, you can easily score 80% in the actual IASSC Certified Lean Six Sigma Black Belt exam if you can score 100% in our online practice exam. Whoa! ICBB exam cleared thanks to the best-ever Lean Six Sigma Black Belt mock tests. IASSC ICBB mock tests are the best thing that i have come across both online and offline. They are designed to give the highest level of practice by the medium of practice questions. Lean Six Sigma Black Belt certificate exam i was able to clear because of this. Finally i passed the ICBB exam thanks god from my first attempt, with an 88% score. I have to say because of the practice i had here, i had no surprises, so i definetly recommend it for anyone planning to enter this exam. ICBB mock tests are more about the practical application as compared to mere theoretical study. It gave me an approach to studying harder and harder with clearing every mock test. Earlier, i had not opted for mock tests and was just studying the syllabus. However, a friend told me that without mock tests nothing would seem appropriate. This made me think and then i went for it. It helped me clear IASSC Lean Six Sigma Black Belt certification exam with good score.